Last Friday it was a new furnace; the week before a new roof shingle job; a month before a new drilled well. Today it's a front door. The door was needed. We had an attempted break-in before we were living here daily. They smashed the front glass but couldn’t get in. Bastards. I "patched it with plexiglass. Quite inelegant. Although it was a nice heavy wooden door, the old glass was single pane so wasn’t very energy efficient. So in goes a vented steel door with argon glass. Should not only make the front look nicer but save on heating costs. Sweet. But what does that have to do with bread? Nothing, really. But man cannot live by doors alone. We do need bread – especially for those quick snacks. 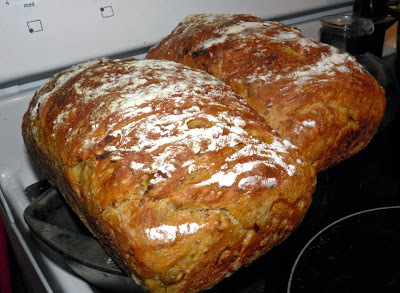 My spouse at college needs bread, too (even though he may not totally agree) – as well as his “landlady,” a good friend. So baking I did. Two loaves. One for the chef and one to help out. This one’s not your run-of-the-mill loaf. 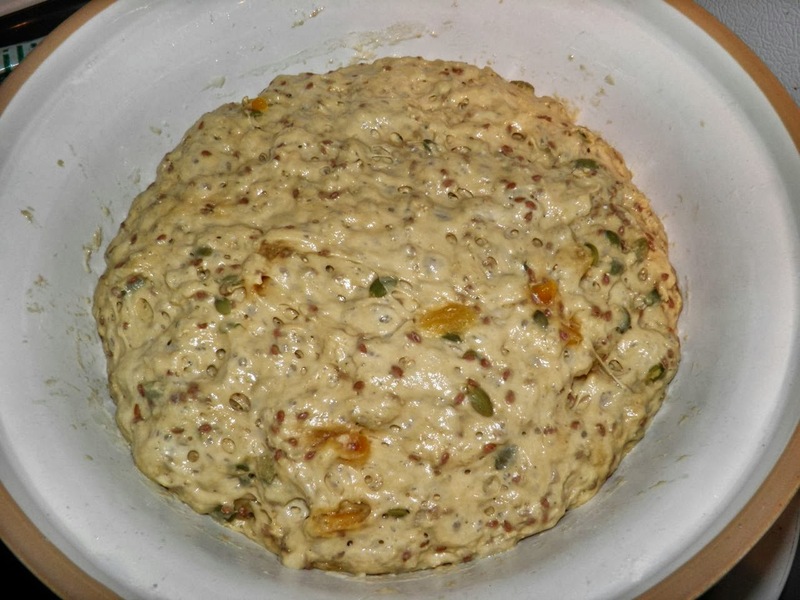 It’s packed full of apricots, pumpkin seeds and flax, so hopefully it is a little healthy, too. I love my no-kneading breads. They do take time (a day, or overnight) but dovetail easily with a busy schedule, much like mine recently. Of course the pepita and flax can be changed. Try walnuts or any other rough chopped nut, or quinoa, or whatever. Variations are endless. For added sweetness I used molasses, but honey could be substituted, too. If you’re looking for a slightly sturdy loaf (most with fruit are) this is one you should try. It was quite delicious, still warm, and slathered with butter! Combine all ingredients in a large ceramic bowl. 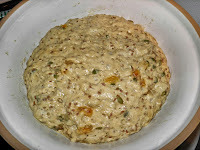 Knead to bring together and then knead in the bowl for an additional 3 minutes. Cover with plastic wrap and a tea towel. Let rise on the counter for 8 hours. Once risen, punch down and divide in two. Fold each piece with your hands into two logs, each able to fit in a 4x8 buttered bread pan. You may need to use a little flour to do this. 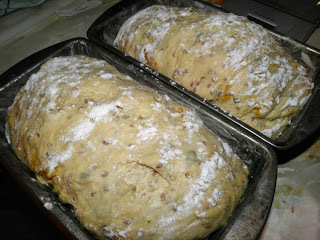 Place the loaves in the pans, dust with flour and let rise again until doubled. Preheat the oven to 450°F with a pan of water on the bottom rack. Bake the loaves for 10 minutes with the water bath, then remove the water and bake for an additional 20-25 minutes. 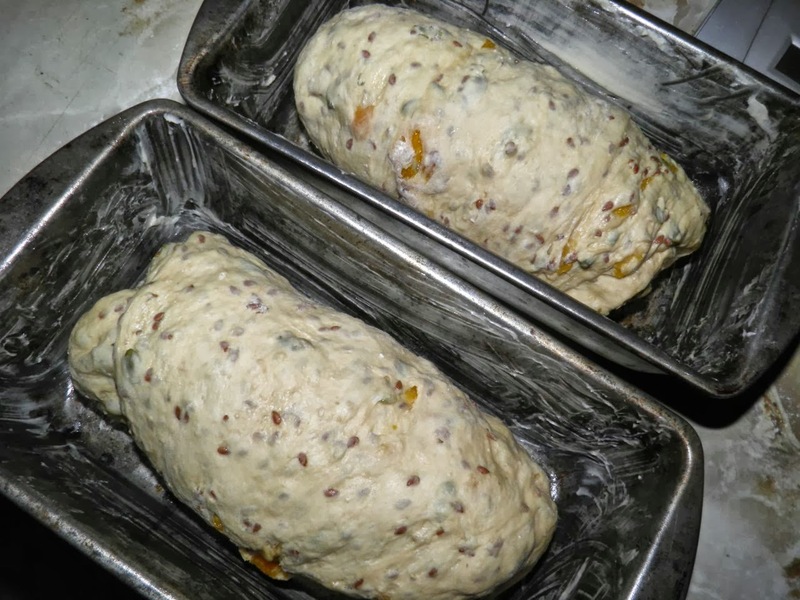 The loaves are done when nicely browned on top and sound hollow when tapped with your fingers. Remove from the pans and let cool on a wire rack.